I HOPE YOUR FALL IS STARTING OUT ON A HIGH NOTE. HERE, EVERY DAY BRINGS A NEW AND EXCITING OPPORTUNITY - LIKE THIS ONE. An out-of-town friend called recently. She wanted a beautiful and special Oregon Sunstone pendant. I wasn't worried about creating an original design for a unique stone as it's what I do, but wasn't sure what specific color and shape Sunstone she wanted. She had seen a lot of them, but hadn't found exactly what she wanted ... there was nothing special about the gemstones available on the consumer market. We went to an award-winning gem carver's website - one who only works with select designers on a personal basis. From a vast array of one-of-a-kind stones, she especially liked two or three gems and said she'd be in Bend soon to start the project. I asked this master cutter to send a selection of gems based on what we had seen online. We had fun looking at the stones in person, a special treat to see so many hard-to-find gems in one place. It's fun for me to work with such an accomplished craftsman. The photo above shows the gorgeous peachy-red pear-shaped custom cut Sunstone my client chose. 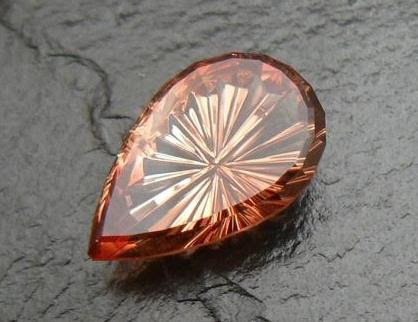 The fancy cutting enhances the shape and the color of the Sunstone, a skill only a few cutters have mastered. His knowledge of gems and their refractive qualities is astounding. No wonder he has won so many awards. One can go it alone, shopping for gemstones online, but well, it's complicated: shipping, quality, pricing, and as important as anything, the ability to counsel with an expert on the other end that you trust to look out for your best interest. And you don't have to pre-purchase all your selections simply to see them up close! Ultimately, a stone is only as good as the design it goes into, and no online gem dealer offers that. Can't wait? Above is a new Tanzanian orange garnet ring in rose gold with diamond accents ready to go home today. That's what I'm here for, to help clients get the best quality, value and beauty and create a special piece of jewelry just for them. Maybe the completed piece will be an award winner as well. All-in-all it was a fun experience working with my friend and her husband. We got caught up, picked out a gorgeous gem, and figured out a unique design for a stunning gemstone. I also suggested two chain styles because rarely does one chain fit all outfits. Are you interested in a fun project like this? Let's talk! In the meantime please come in for a free cleaning and inspection. It's key to keeping your jewelry in good shape, and extending its life. 2018: the year of creativity, ingenuity, "third eye chakra"